Michelin Star Chef Dani García talks exclusively to Andalucia.com about local cuisine, his favourite food and his restaurants Calima, Marbella and Lamoraga, Malaga. From his Restaurant Calima (two Michelin Stars), in Marbella (which he moved to the Hotel Puente Romano in spring 2014), this young but high-profile Andalusian chef tells us how he started out in his chosen profession, what he likes the most about it, his professional goals ... and his favourite dish. AC - When and where did you discover your passion for cooking? Dani Garcia - From a very early age I enjoyed everything to do with restaurants, especially the world of cooking. Although it wasn´t until the age of 16 that I decided to dedicate myself to it professionally. Like every boy at that age, I wanted to be a footballer or something like that. AC - When you began your career as a professional chef, did you ever dream that you would achieve the prestige and recognition that you have now? Dani Garcia - No, it´s not something that ever even crossed my mind. Once I went to catering school, I realised that it was a world that inspired greater passion in me than I had previously thought. From then on, my only objective was to learn as much as possible, and that is what I did - I didn´t stop working even though I didn't have a specific goal. I already have much more than I would ever have dreamed of at that time. AC - What is your main motivation as a chef? Dani Garcia - I have always had very clear motivation in my day to day life as a chef, it is simply to make people happy through my cooking. AC - Out of all your professional achievements, which are you proudest of? Dani Garcia - It is always difficult to pick out one achievement as being more significant than another, but I do feel proud of something that I am almost never asked about that was very important to me. 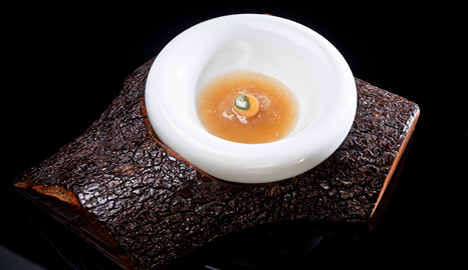 In ´98, when Tragabuches opened and I was head chef, to be able to put gazpacho, gazpachuelo and ajoblanco on the menú of a very prestigious restaurant was madness, unthinkable. Haute cuisine was linked with caviar, foie gras, truffles, and French cooking. We knew clearly that we wanted to cook our traditional recipes, and at the same time we wanted to be an haute cuisine restaurant. AC - What are you dreaming of at the moment? What is or are your current professional goals? Dani Garcia - I never set myself goals, or any type of objective. But yes, I dream about lots of things, and the people closest to me are in charge of putting me in my place so that I dream just the right amount. Although right now I have two main priorities: to get Calima running solidly, and open Lamorga in NYC... Those are of paramount importance for me this year. AC - What do you like most about your job? 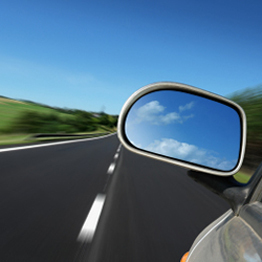 AC - What is the best piece of professional advice you have ever been given? AC - Can you tell us who told you that? 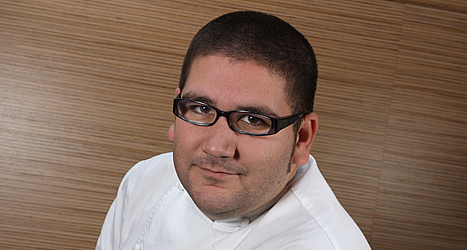 Dani Garcia - I've been lucky enough to get advice from people like Martín Berasategui and Juan Maria Arzak. But I always keep very happy memories of conversations with Ferrán Adría and his advice, mostly reflections about everyone we work with as chefs. They are conversations that I have recorded in my mind forever, and I reflect on them some days. There is a lot of very good advice. AC - What is your favourite part of the day? Dani Garcia - If we offer a good service, if the diners in the restaurant look truly happy, then that is without doubt the best thing that can happen at the end of the night. AC - What is the first thing you think about when you wake up? Dani Garcia - Whether I have lots of or few things to do. Every day is different - there are crazy days, and others that are very quiet, but you always end up doing something that you hadn´t thought you'd have to do. AC - What do you do in your free time, to relax? Dani Garcia - I am a very normal person - I love being with my family, and also with my friends. Playing a game of padel, watching Barça and eating fried fish would be the perfect day for me - especially if Barça win! AC - Where in Andalucia do you most like to spend days off? Dani Garcia There are some really great areas of Andalucia, but - and not just because I was born here - Marbella is definitely my favourite place to live and to rest... Ronda would be the second. AC - And what is your favourite dish? Dani Garcia - Ajoblanco from Málaga. Dani also helped relaunch Lamoraga in Calle Fresca, 12, Málaga. 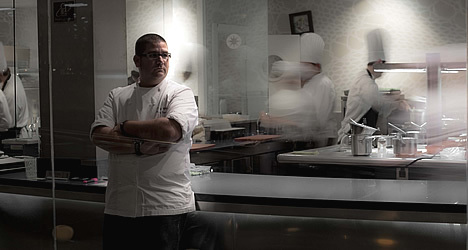 He currently has two restaurants at the Hotel Puente Romano in Marbella: the three-Michelin-starred Dani Garcia, which will close on 22 October 2019, and BiBo tapas bar.